Lauren - Blanchard, OK An Upgrade Over Fixed Stand "I have two nearly identical stands branded differently - one was with standard feet (the MX EZ UP) and the other had wheels. These wheels popped up on Motosport, so I decided to grab them as I like to be able to move the bike around. Really, this should have been at least offered as an option when the stand is purchased. But, as is, it is a nice upgrade. However, the wheels are very resistant to wanting to move around. 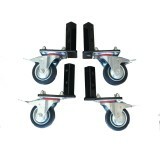 Our other stand has two smaller wheels per foot and it moves around extremely easily. This one really does not want to go anywhere until all the wheels are pointing in the same direction - then it only wants to go in that direction. lol. I prefer the other design - you could spin that one in a circle if you wanted to. I'm hopeful that these just need some break in and then will still be more compliant over time. My only other comment would be that the screw holes are poorly drilled. They look ugly and it took working each screw out and in repeatedly to clean up the threads. So I gave it 4 stars for making the stand more useful, but would have given it 3 stars for design and manufacture." mxracer8872 - Long Valley, Washington Township, NJ 07853, USA Good option ... but it should NOT be an option. "This wheel kit is almost mandatory for the Team Hawg MX EZ UP stand. It makes moving your bike around nearly effortless. My only complaints: it did not come as standard equipment with the Team Hawg stand and the rubber on the casters seems a bit soft. Rolling the stand, while loaded, across rough pavement is a bit tough. Urethane roller blade wheels might have been a better selection. All in all ... this is ALMOST necessary, unless you have a dedicated area to park the stand."